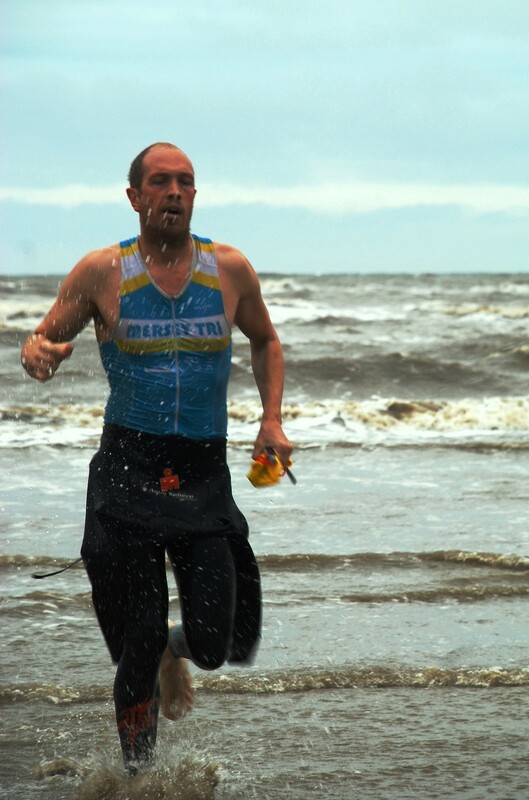 23 Mersey Tri members, some competing in their first ever race were joined by 17 RNLI Lifeguards for the SEALMAN Aquathlon at Ainsdale beach. While weather conditions appeared fairly calm and cool, the incoming tide hitting the sandbanks created a real challenge as the crashing waves met the swimmers charging into the sea. The 750 metres swim proved to be a mixture of swimming, walking and diving as the swimmers struggled around the first buoy and made their way through the surf. First out of the water was newcomer John O Neill who was followed by Al Smithson and Rob Hornby. In the ladies race, lifeguard and GB international Lindsay Murphy led out of the sea but was chased down on the run by Samantha Howard who stormed to victory. In the men's race Al Smithson took the lead on the run and held off last year's winner Rob Hornby with John ONeill taking third. Fastest run split of the day went to Tony OBrien who was fourth and winner of the V40 prize. All finishers received a Sealman towel. Mersey Tri would like to thank RNLI for providing competition and excellent safety cover. Race photos can be found in the gallery section of the website.